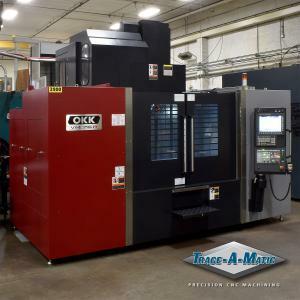 Trace-A-Matic OKK VM76R vertical machining center installation. Trace-A-Matic Corporation continues to invest in manufacturing technology to ensure the highest level of machining tolerances and efficiency for its customers. Trace-A-Matic Corporation continues to invest in manufacturing technology to ensure the highest level of machining tolerances and efficiency for its original equipment manufacturing customers. Trace-A-Matic machines precision parts and assemblies for manufacturers in the aerospace, defense & military, food processing & pharmaceutical, heavy equipment, medical equipment, mining, oil & gas, power generation, transportation, and general industrial markets. The company’s state-of-the-art facilities use the latest CNC manufacturing technologies to produce complex and intricate components that meet or exceed the most critical tolerances. They machine parts from castings, weldments, forgings, tubing and bar stock that range in weight from 1 pound to 15,000 pounds. Trace-A-Matic was established in 1968 and has evolved into a multi-facility operation with locations in Brookfield, WI and Houston, TX serving the US and international customers. They employ a highly skilled workforce of 200+ people that operate 120+ precision machining centers in a combined climate controlled environment of 300,000+ square feet. Visit https://www.traceamatic.com for more information on Trace-A-Matic.